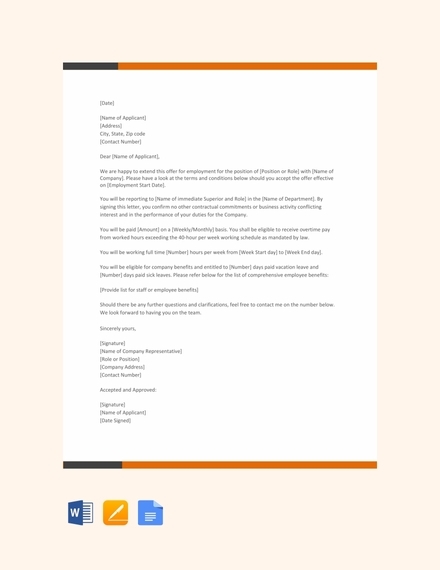 Making an offer letter is an important function of the human resource department no matter what industry or field of expertise the business belongs. Giving an offer letter to a qualified applicant, who you have selected for potential employment, makes the entire hiring process more formal. 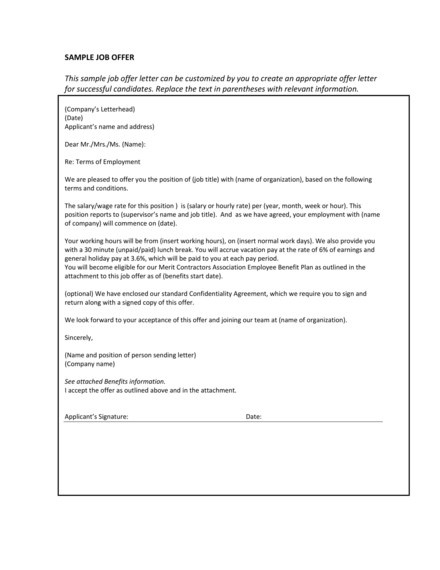 The usage of this document can also present what the company can provide the applicant with once he or she accepts the offer for employment. Are you planning to write an offer letter? 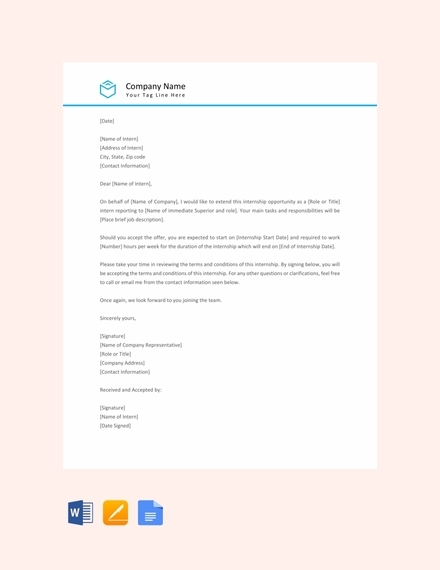 We have listed examples and templates of different kinds of offer letters in this post for your reference. 1. Basic letter content: Complete all the basics of a standard letter. Ensure that you will include the date when the offer letter has been made, the name of the applicant, the corporate name and brief information of your business, the subject line, and other information that can make the document as comprehensive as possible. 3. Proper job description: It is important for an offer letter to identify and discuss the job position that you are offering to an individual. Provide a clear definition of the job title as well as the items that are needed to be delivered and/or achieved by the potential employee. In this manner, proper expectations can be set. 4. Specification of job requirements and demands: Though most companies list down job requirements on their employment contract, having an overview of this subject matter within the offer letter can also help applicants be more prepared for employment if they will accept your offer. You do not need to be too specific when presenting job requirements and demands in the offer letter as you can discuss these items further in the contract that you will provide or give the employee with. 5. Brief description of benefits and other entitlements: Since the main objective of providing an offer letter is to persuade your selected qualified applicants to join your team, you should mention the benefits and other endowments to entice the applicants to accept your offer. 1. Research: Look into different examples and templates that you can use as references and guides if you decide to start making an offer letter. Formatting the letter accordingly is essential. 2. Have an outline of the offer letter content: Make sure that you will cover all the important items that are important to be known by the qualified applicant. 3. Gather the necessary details: Specify the date when you have written the offer letter. 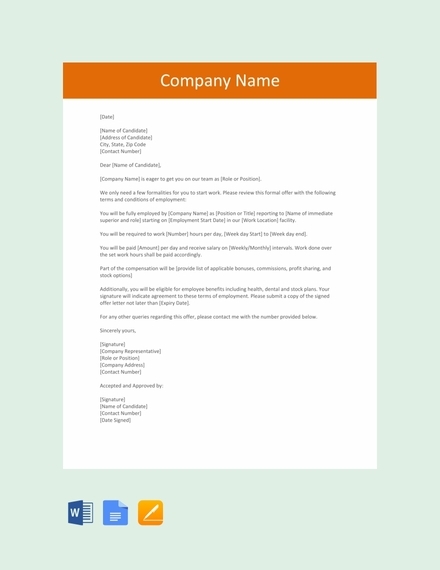 Also, ensure that you will put the accurate name and other business information of your company that are needed to be seen in the offer letter. 4. 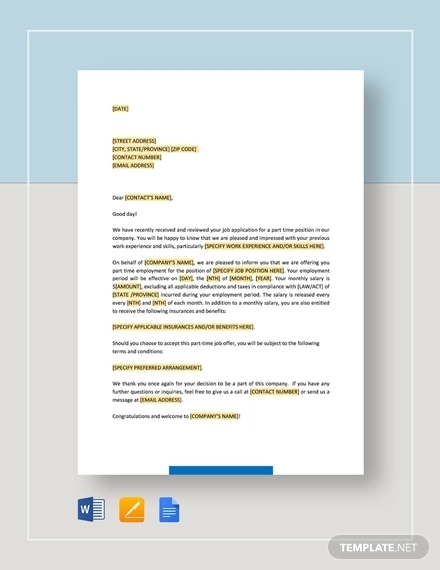 Make your introduction good: Open the letter with a professional tone. Ensure that you can get the attention of the qualified applicant by incorporating enthusiasm in the mood of your discussion. 5. 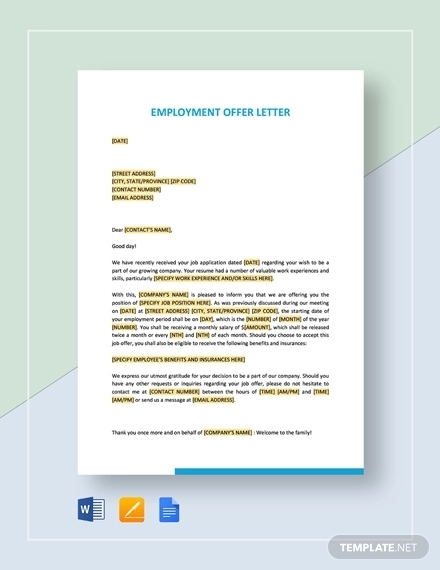 Develop the body of the letter:The information that are expected in the offer letter include, but is not limited to, the base salary of the individual, the status of employment that you are offering, the job description of the work position, and the other benefits that the qualified applicant will be entitled with. 6. List the terms, limitations, and other special conditions of the offer letter: Ensure that confidentiality and other clauses and agreements must be defined and presented accordingly. 7. Conclude your letter: End the offer letter with a positive tone and make sure to place a signature note at the end of the letter. It will also be good if you can specify the date in which the offer letter is expected to be returned. Have you ever created an offer letter? Or is it the first time that you got involved with its development? 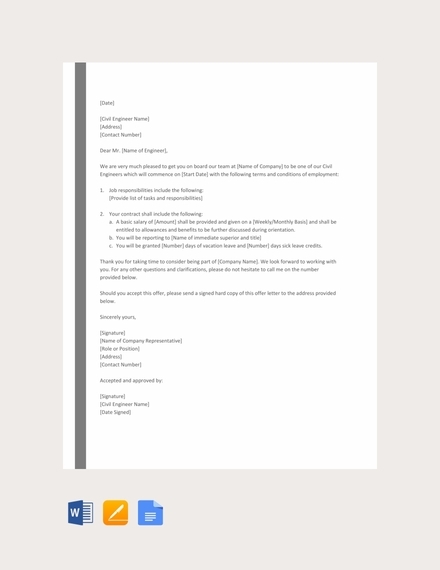 An offer letter is an easy document to create but it can also be tricky and challenging to make if you are unaware of the guidelines that you need to follow. If you want to begin making an offer letter, following tried and tested guidelines can help you a lot. A few of the tips that can make it easier for you develop a great offer letter are listed below. In comparison to the creation of resignation letters, your offer letter must also be written in a professional or business-appropriate manner. 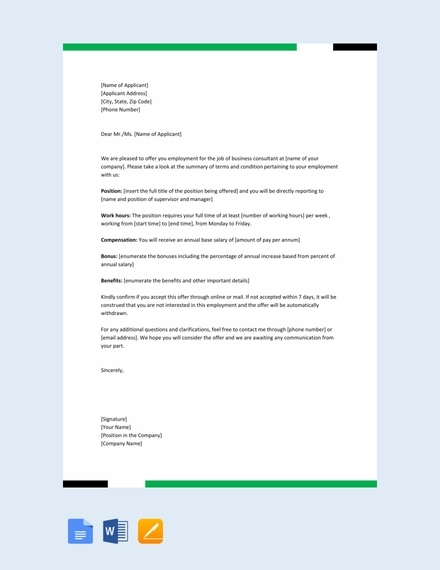 You have to ensure that the offer letter can present your organization as a reliable, credible, and outstanding brand. 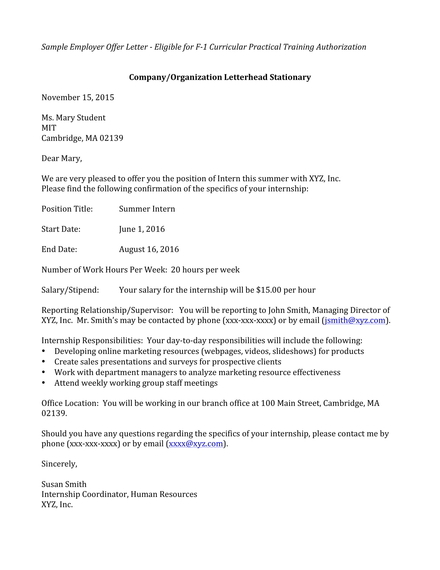 Your offer letter must be appealing so you can get the attention of qualified applicants. 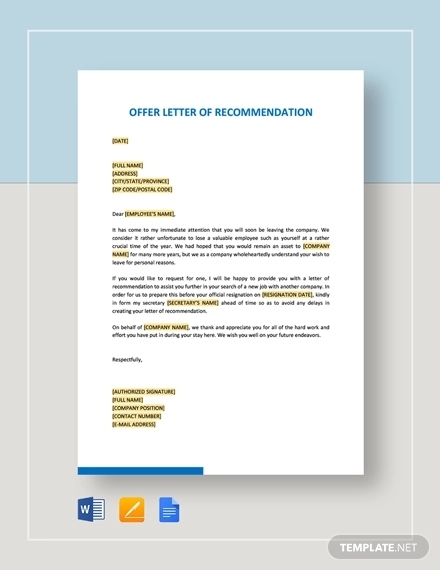 Having an impressive offer letter can higher the chances of individuals to accept what you can provide them with in exchange of their skills, expertise, services, and other deliverable. 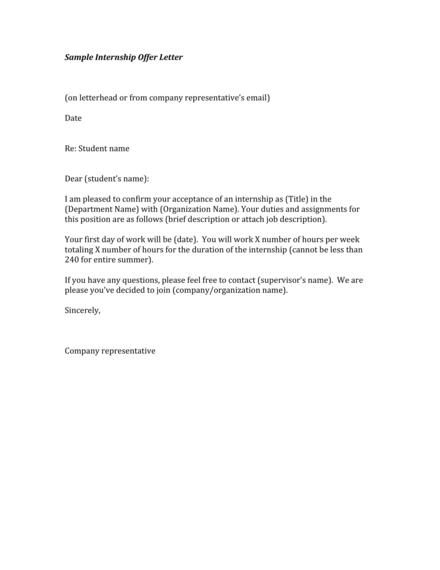 The offer letter that you will be making must be organized. Do not just focus on the letter content as you also need to prioritize the layout where you will place your discussion. 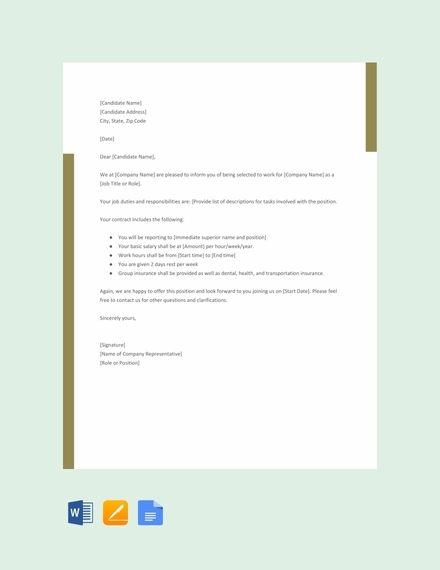 Make sure that all the items in the offer letter are real and updated. 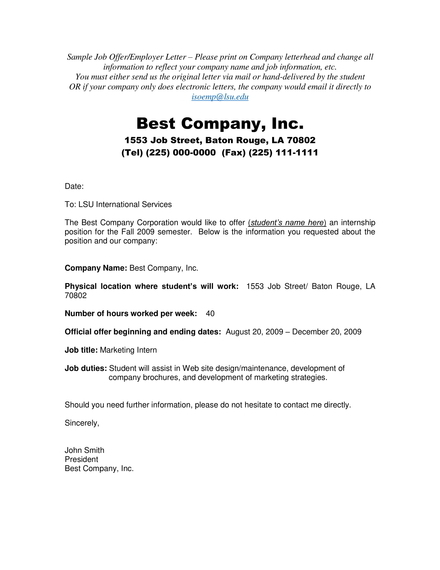 The accuracy of the offer letter’s content can help you maintain your credibility. 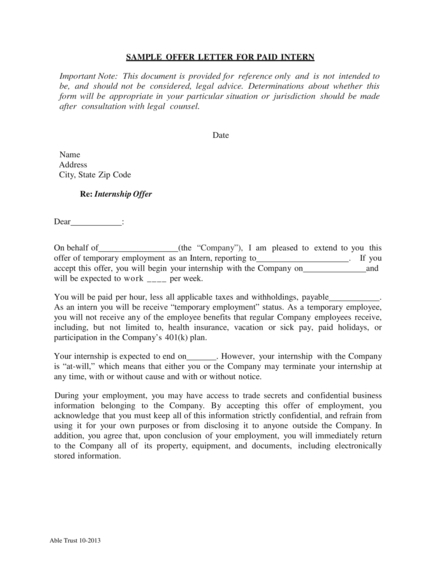 Review the offer letter first before giving it to the individuals that you would like to hire. Scan the document properly and make changes or updates when necessary. A basic offer letter can either be in A4 (210×297 millimeters or 8.27×11.69 inches) or US letter (215.9×279.4 millimeters or 8.5×11 inches). 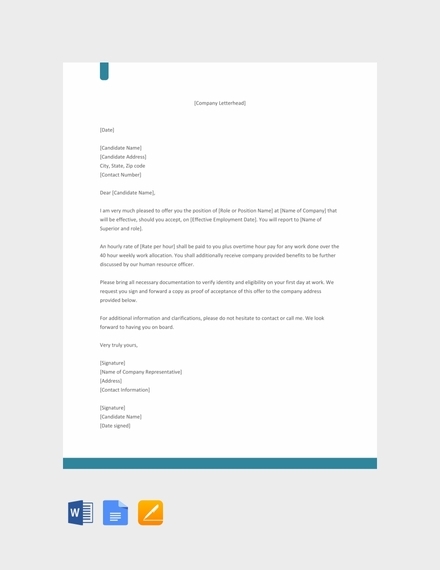 This is for the reason that using business-appropriate letter sizes allows the presentation of an offer become more formal and professional. 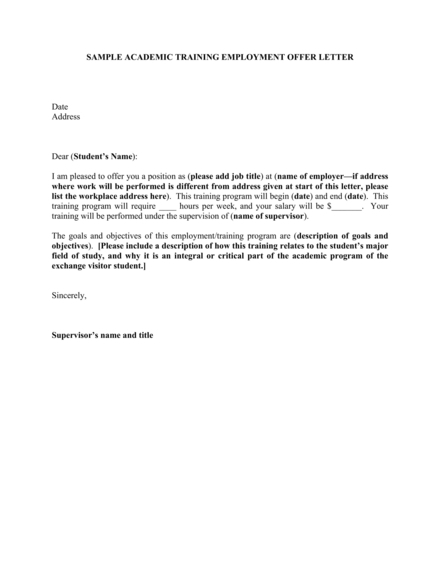 Offer letters are regarded as business documents that are usually given out by the human resource department. 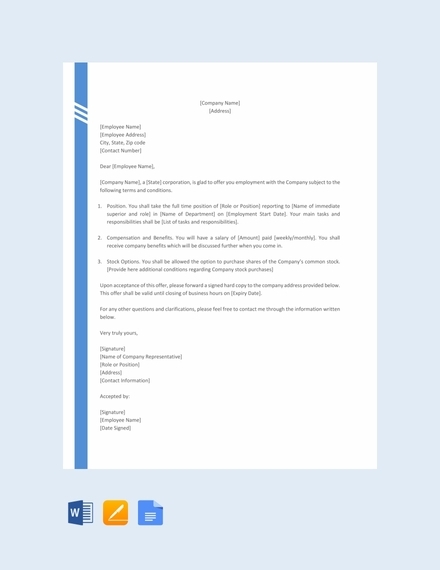 Hence, it is important for the sizing of this document to be the similar with other letters written and provided by the company. The same paper size standard usually also goes for reference letters, letter of application examples, letters of appointment, and other letters used in application and hiring procedures. 1. 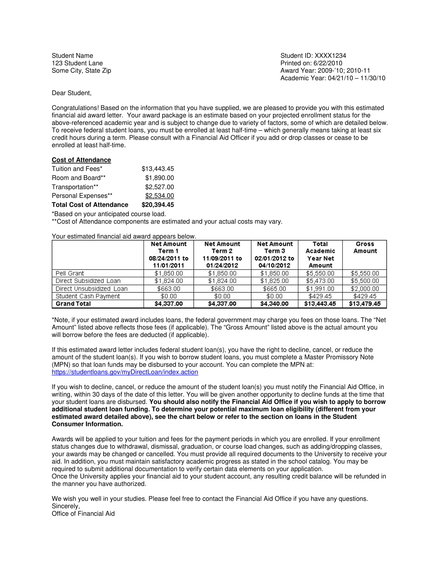 Why is an offer letter important? 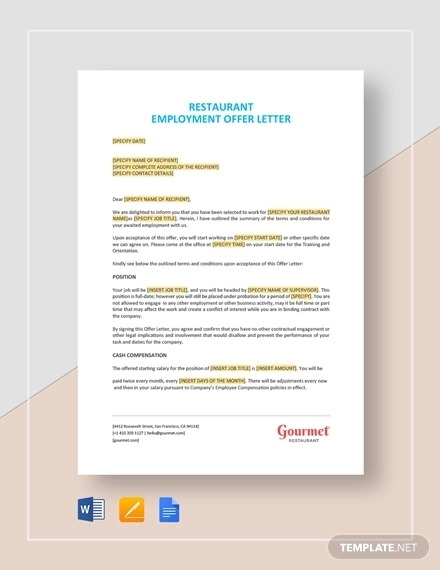 An offer letter can help your business provide an idea of what should be expected by your potential employee. 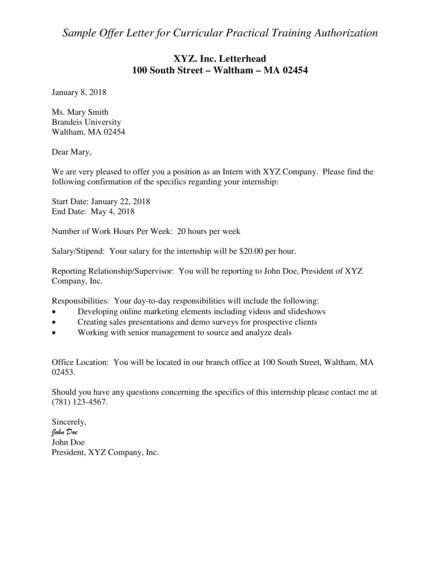 Creating an offer letter can make the transaction more understandable—from salary discussions up to other items that can make or break the decision of an applicant to be a part of your organization. 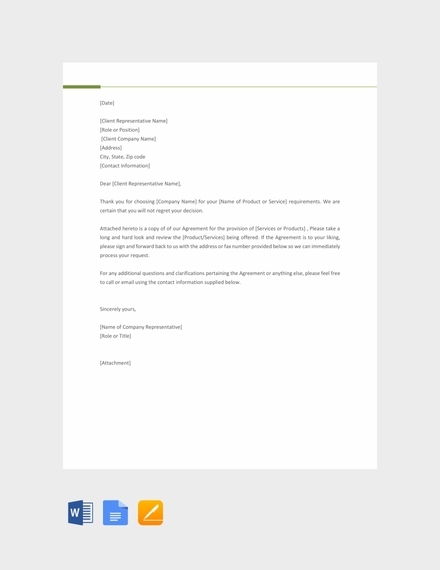 More so, having an offer letter can help your organization protect itself from malicious or false claims with regards your job offers. 2. 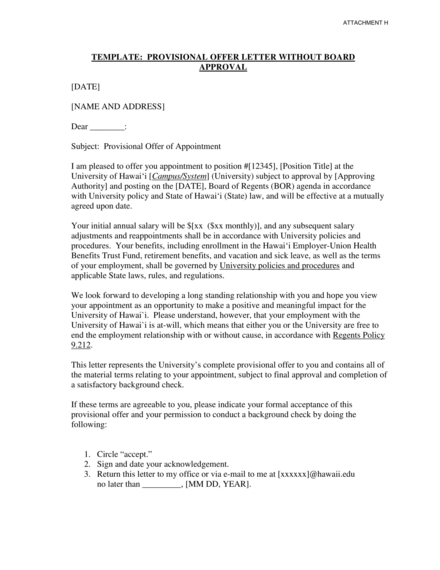 Is an offer letter really necessary? Even if you will provide a contract to potential employees, it will still be best if you will initially hand them an offer letter. A contract is more specific and should only be given to individuals who are more than willing and sure to be a part of your business. 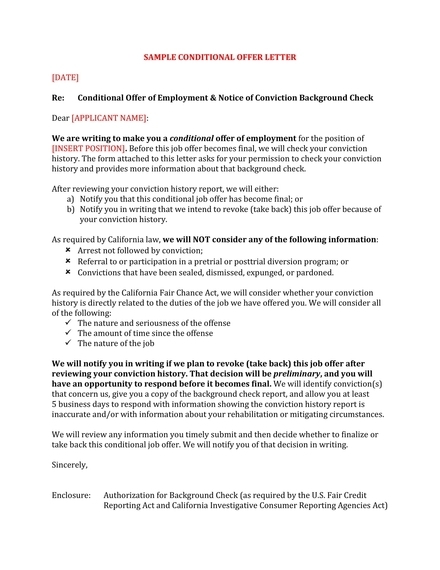 Using an offer letter is necessary as it can give hiring information and confidential matters more protection. 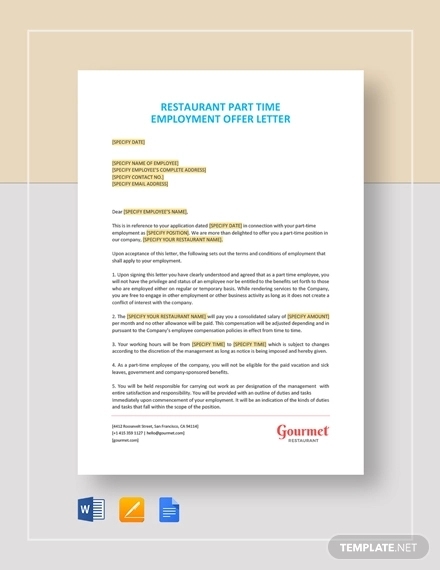 Providing an offer letter is a great way to present the job position, description, and benefits first before knowing the decision for employment. 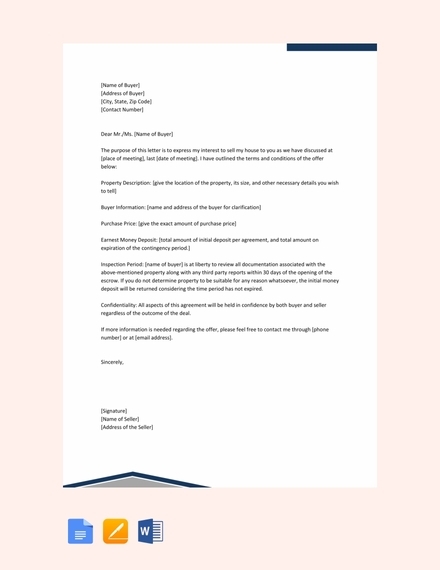 Just as how email newsletter examples, templates, and design ideas help better both the content and format of an email newsletter, using references can also allow you to create offer letters with better quality. 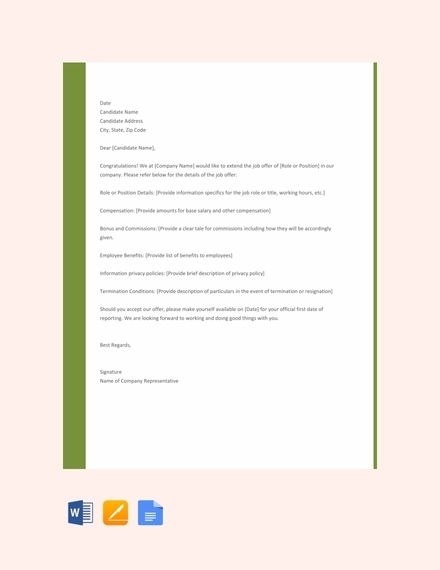 Make sure to browse through and download any of the offer letter examples and templates listed in this post so you can come up with an outstanding offer letter.